Chris Graff, born in suburban Connecticut, moved to rural Vermont in 1965 at the age of 11. His father had died the previous year and his mother had married a man who lived on a gentleman’s farm near the end of a dirt road in North Pomfret. To Graff the 100-acre parcel seemed like the end of the world, but through the years he would come to cherish the spot as one of the most beautiful anywhere – and the state as home to some of the most special people in the world. Graff graduated from Middlebury College in 1975 with a degree in American history. At Middlebury he entered the world of broadcast journalism when the news director of the college radio station, Jim Douglas – who went on to become Vermont’s governor – was looking for students to help cover the funeral of a U.S. senator. Graff spent his four years at college working at the radio station. After graduation Graff went to work for Middlebury commercial radio station, WFAD, where he hosted a talk show, reported on local news, and covered the State House. In 1978 Graff joined the staff of The Associated Press as a reporter in the Vermont bureau, located in Montpelier. Two years later he was placed in charge of the bureau, a post he held until 2006. In his years with the AP Graff covered the critical stories as the state transformed itself from a rural, Republican outpost into the state of Howard Dean, Jim Jeffords, Pat Leahy and Bernie Sanders. Graff has hosted Vermont Public Television’s Vermont This Week since 1992. He also hosts numerous other programs for the station, including Call The Governor and Report From Washington. He has also provided news analysis for Vermont Public Radio. In the 1980s he interviewed all of Vermont’s living former governors for a series on Vermont Public Television; in 1999 he wrote and helped to produce a documentary of the major news events of the 20th century in Vermont. 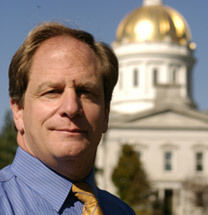 Graff lives in Montpelier with his wife, Nancy Price Graff. They have a son, Garrett, who is an editor at Washingtonian magazine, and a daughter, Lindsay, who is a senior at Connecticut College.